Reproducibility, sustainability and resources are all currently very high on the agenda and more important than ever for lab scientists. Could there now be some solutions to these concerns for those working with RNA? RNase contamination is a nightmare for any scientist working with RNA and controlling RNase contamination is not an easy ask, especially as the pattern of contamination is completely unpredictable, as the team at Phoseon Technology (OR, USA) discovered when they decided to put it to the test. Using numerous sets of 96-well plates placed in various locations and left over the course of a day, the team observed that some wells would be completely clear of RNase contamination, and some would be completely contaminated. They concluded that it was completely sporadic, with no dependence. “We expected it to be like the accumulation of snow on a winter’s day – steady and constant. But instead, it can be sudden, unexpected and catastrophic. It’s not easily defined. You could have no contamination for an hour of leaving equipment out, or it could be contaminated the moment you open a sterile package,” explained Theresa Thompson, an application scientist at Phoseon Technology. It can therefore be easily concluded how RNase contamination would lead to increased waste, lost time and reproducibility issues. All three of these problems are incredibly timely issues when society, politics and sustainability are considered. In any path of RNA research; if there is any degradation of the sample, results can be inconsistent, inaccurate and hard to come by. Though RNase is incredibly resistant to inactivation, usual routes of RNase decontamination include treatment with DEPC overnight and autoclaving, which is incredibly time-consuming. Many experiments are carried out in Tris buffers. These buffers cannot be subjected to the same decontamination methods, as DEPC attacks the amino groups of the Tris, limiting its buffering capacity and destroying itself in the process so leaving it unable to inactivate any contaminating RNase. 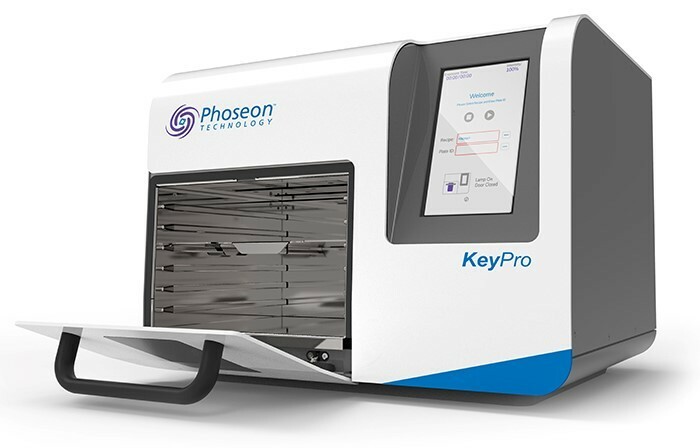 Phoseon Technology discovered that a UV wavelength of 280 nm can target RNase A, leaving it irreversibly inactivated, with no drift on the pH or buffering capacity of the Tris buffers. Phoseon have since incorporated this into their own novel technology platform, KeyPro™, formed of high intensity LED-based lights that can reach intensities that haven’t been achieved with other light sources. Immediately before running any experiment, the platform is switched on, and in less than 5 minutes, all equipment, including Tris buffers are completely decontaminated of RNase. The ways in which this platform can benefit researchers, can be drawn into a much bigger picture of the key issues for scientists at this current time. The reproducibility crisis is a current and ongoing crisis in life sciences, in which many experimental methods cannot be reproduced. The reproducibility of experiments is an essential part of the scientific method, as succeeding research and hypotheses are based upon the fair but false assumption that these unreproducible pieces of research can be reproduced. As we know now, RNase contamination is random. While some wells in a 96-well plate might be completely RNase-free, some could also be completely contaminated. “The platform is different from an autoclave – it’s a solid-state lighting system, with calibration to ensure the same amount of light is always being delivered. Even as diodes themselves age and an individual diode has less output; the system compensates for that every time it’s run. The same protocol you run today is going to give you the same output 5 years from now,” commented Jay Pasquantonio, Senior Product Manager at Phoseon Technology. The light ensures the same decontamination across all 96 wells of the plate, so there is no need to worry about varying results based on RNase presence in particular wells. Public distrust in scientists is at an all-time high, with the reproducibility crisis invalidating theories and fake news rife. Therefore, any reassurance of reproducibility will bring comfort. Funding for scientific research is currently a cause of concern for many schools, colleges and universities. Unstable political environments have led to cost cutting and more careful fund planning. Purchase of RNase-free Tris buffers is expensive, as well as being potentially wasteful and unsustainable. Time as a resource is also becoming increasingly strained. With people working more hours to achieve results, time really is of the essence. KeyPro takes less than 5 minutes to decontaminate Tris buffers of RNase and prepare them for use. The experiment can be run immediately afterwards. This saves huge amounts of time in comparison to the traditional methods of decontamination. 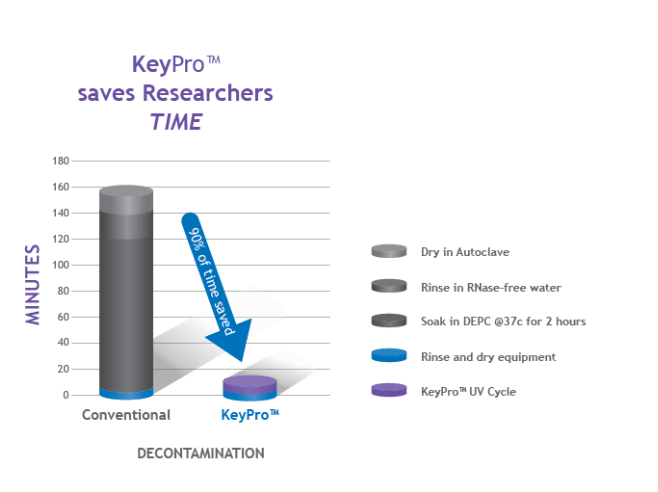 A demonstration of the time that can be saved using KeyPro in comparison to traditional contamination methods. Additionally, once RNase contamination occurs, which could be as soon as exposure to air, the experiment will need to be disregarded and the decontamination process will need to be completed again, which means researchers could find themselves wasting huge time periods unnecessarily. Not only does use of the KeyPro system have the potential to limit single-use plastics waste, it can also limit the volumes of reactant, buffer and product waste, which can also be quite costly. If buffers are decontaminated immediately before use, small volumes are taken and used immediately, therefore levels of waste can be kept low, as there is no need to dispose of any potentially contaminated solutions and there is no unnecessary excess. To conclude, the KeyPro conquers issues close to the hearts and minds of life scientists, which all combine to make life that little bit easier. Whether it be saving time on decontamination that can be better spent with family or friends, saving money that can be better spent on other key resources, or limiting the amount of waste produced from an individual’s research, and contributing towards ensuring a more sustainable future.